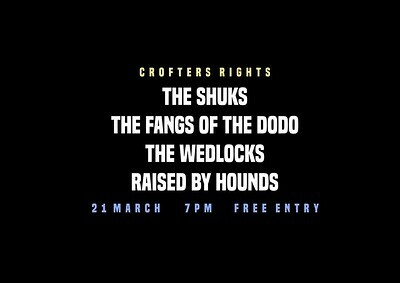 Bath based four piece The Shuks are quickly making a name for themselves on the alternative DIY scene after playing a multitude of popular shows across the country. With loaded lyricism and raw energy, their songwriting calls upon the likes of Pixies, Smashing Pumpkins and The Velvet Underground, yet morphs and bends genre to achieve applicability across a broad musical spectrum. After supporting the likes of Haze, Dead Pretties and YONAKA, The Shuks are now looking forward to upcoming support slots for Vinyl Staircase and FEET ahead of the upcoming release of their third single. Nightmarish and villainous, the Fangs of the Dodo transport you through their dystopian fairground with all the force of a ghoulish freight train. Treading the high wire between out right catchy and down right daring, Fangs’ put on a stage-show guaranteed to electrify. Miss it at your peril. The Wedlocks are warm-hearted, sensitive and up for a good time. They're looking for someone who shares their love of post war literature and Shostakovich's Jazz efforts. Must be hip enough to quote the works of Evelyn Waugh but not in a way that might prompt jealousy or self-doubt. Must also be ok with band bios being written in the form of lonely hearts ads. Raised By Hounds came together in September 2016 having met in the city of Bristol, Somerset. Since the release of their debut single "Samurai Jack" their stage shows have built the anticipation for their future. Combining the grit of the british indie/grunge scene with the legendary expression of the 80s LA sunset strip. Their performance is electric and their sound is emphatic. This is a band that will leave you wide-eyed and giddy.